ISRO (Indian Space Research Organization) is a Space Research Organization of Government of India. It is located in Bengaluru. ISRO was established in 1969 by replacing Indian national committee for space research (INCOSPAR) which was established in 1962. 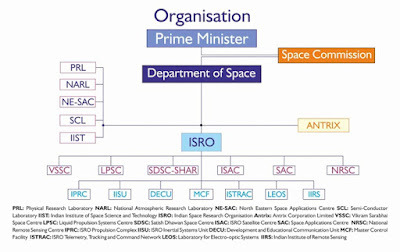 ISRO is managed by department of space which falls under Prime Minister of India. Vikram Sarabhai also known as father of Indian space program was the first Chairman of ISRO. It was his effort which helped to establish ISRO. On 28 September 1992, Antrix corporation was established. It is a commercial arm of ISRO which promotes services and products of ISRO. The first satellite developed by ISRO was Aryabhata. Aryabhata was launched was by Soviet Union on 19 April 1975. The first satellite developed and launched by India was Rohini satellite. ISRO has developed many satellite launch vehicles. The satellite launch vehicles in order of their creation are SLV (Satellite launch Vehicle), ASLV (Augmented Satellite launch Vehicle), PSLV (Polar Satellite launch Vehicle), GSLV (Geosynchronous Satellite launch Vehicle), GSLV Mark III. PSLV is one of the most trusted satellite launch vehicle of world. 1971 Satish Dhawan Space Centre formed in Sriharikota, Andhra Pradesh.